Discussion in 'Molting.' started by erksh, Nov 5, 2009. This guy is new, but I SWEAR he didn't have those nails when we rescued him. I didn't take photos, we were too busy getting them into a saltwater situation and some food. It's hard to say. If he was only under for 2 days, I'd hesitate to say that he molted and recovered in that time period. Even for surface molters (who harden faster than buried molters due to the drier conditions on top) it takes a week to harden at a minimum. If he had molted, he should be paler, too. What do you mean by "nails"??? This guy is new, but I SWEAR he didn't have those nails when we rescued him. I think he was like that when you got him. Even in lousy conditions before he may have molted, or, if there wasn't much to do, climb on etc, some of the smaller crabs can hang onto those nails for a long time. Wow that's some awesome color. Impressive Never seen an Ecuadorian with red. I know, right? I just loooooove him. And he was NOT that color last week when he came home. He was dustier, ashy and pale. I need to get him some shells. His is measuring at 1 inch with calipers and I only have a couple of fox shells and one whales eye that're close. Molting isn't something that occurs over a long period of time. The actual "molt" (shedding of the exoskeleton) is done within a few hours, sometimes up to a day. The recovery period is what takes so long - they have to allow their new, moist exoskeleton to harden which will take longer if they are buried and less time if they surface molt. The points on the ends of his legs (look at the top picture, the leg on the left of the claw). A freshly molted crab will have those points (and they can be really sharp - one of my PPs almost broke skin on my arm with his; I had pink welts for a day from him trying to climb my arm) but they can break off or wear down over time. He DOES look freshly molted, but I don't see how he could have done it in just 2 days. Did he go into either of the water dishes when you first got him? All I can think of is he was pale and ashy looking because he was dehydrated and he already had the hair and nails but you just didnt notice, now that he is being taken care of and had some good food and drink he may just be feeling better and have better coloring. He probably molted right before you got him and didnt have the proper care post molt. Swimming -- he spent all of his time swimming in the salt water when he arrived. My husband says it was more like three or four days under. My attention was on the kids (grades out this week) and I wasn't paying much attention to a quiet iso. We both (hubby and myself) notice that he fits much further back into his shell than he did when he came home. He wasn't able to retract like that. He had legs hanging out. Hmmmmm...I wonder! It will forever be a mystery. Wow! That's shocking and amazing! He looks like he's freshly molted, but two days is usually too short for the exoskeleton to completely harden and for them to regain their color (especially that pretty color he has!). EDIT: Three or four days makes more sense. And they are little smaller after they molt until their exo completely hardens. It's just amazing how he did it so fast! He is so cute by the way!!! I think crab color is a little more dynamic than simple pigments deposited in their exoskeleton, at least, there is some decent descriptive evidence that this is the case. 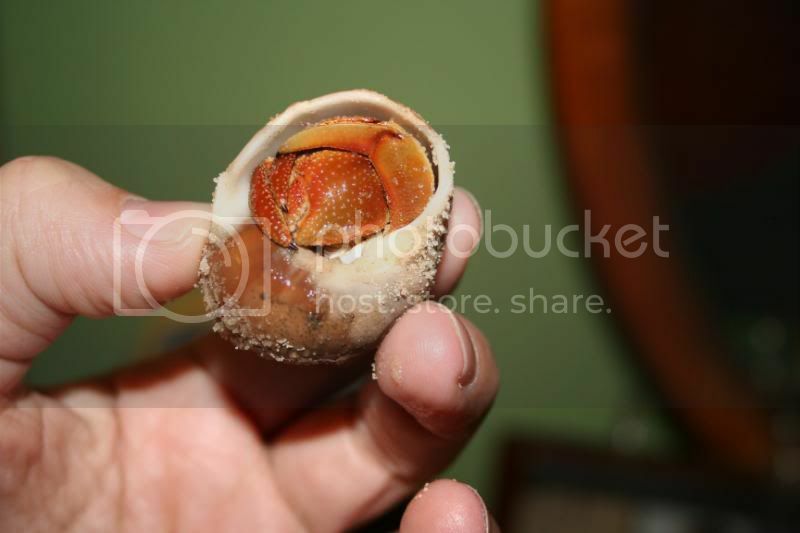 I have also had the expereince of crabs coloring up after I got them, but without molting. I know someone who got some purpureus or violascens that were rather drab and over the next few weeks to months their color had improved drammatically but not through molting. I can find no decent reference to color control and such in coenobita (if anyone has one - please share!) but I suspect that they can and do at least alter the intensity of their color between molts. I have been wondering if various lighting can change crab colors as well as possiblyu dietary ingredients. Different wavelengths of light can alter color expression in a wide variety of vertebrates and invertebrates - perhaps hermit crabs are one of those groups. And - I agree - that orange-caramel color is terrific. I have one who has some very rich brown and caramel colors and he (I think it is a he - haven't really looked) is spectacular. He also darkened up quite a bit after being in his present home for about 10-14 days. Interesting, Keith...I can see the line of thinking. One could suppose that less-than-optimal living conditions would divert energies to those not necessarily integral to survival, leaving things like coloration on the back burner, to be revived upon the restoration of healthy levels of nutrition and hydration. While an exoskeleton is a shell, it is NOT a body bag, independent of the organism. Thinking back, I have anecdotal evidence of just such an oocurence with our first PP, who most certainly did NOT molt in our care but did restore some color and luster to her exo. This guy arrived with two friends who are still nowhere to be found (micro E's -- buried for a week + at this point). I am eager to see what they look like upon resurfacing. great post emma, didn't know the molting process takes only a few hours. My crabs have been down under for about 4+ days now :] I'm anxious to know what they are doing but trying to sit on my hands and not disturb them hehe. Could you possibly post like a list of characteristics that attribute when they want to molt, as well as the changes to look out for when they have molted? That would help a bunch since I'm so new to all of this! Keith - I do not have any 'research' about crab coloring, but I do have the example of my crabs. I have been feeding Astaxanthin powder on an approximately 5-7 times a week basis for several months now (bought from the Addiction store). At this point, all of my PPs are turning purple (crabs who used to just be red/pink are now deep red with purple all over both claws and legs; I do have two who are younger who haven't gotten the red yet, but are pink with the deep purple) whereas my Es are starting to develop caramel brown accents and red/orange accents on their legs and claws. Each molt they go through further deepens their color. If you want to see recent pictures of most of my crabs, go to the link in my signature - I think it's got everyone's picture (except for my shy guy) on there now. Missy - pre molting symptoms vary by species, and not all crabs will display them. Look for an 'ashy' look to the exoskeleton, and if you look closely by the joints of the legs you can see the old exo pulling away from the new one. Crabs will generally eat and drink (especially ocean water) a ton before going down because they could be down for up to two months or more with no food or water. 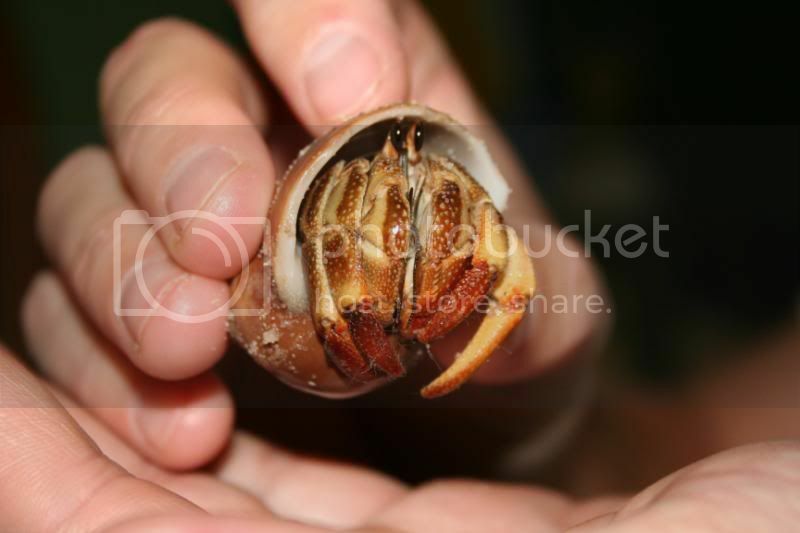 After a crab has molted, its exo will be pale until it hardens, at which point the color should be different (darker if good nutrition pre-molt; lighter if not), it will have 'hairy' legs, and its legs will have sharp tips on the end like in the photo at the beginning of this thread. thanks for the info. What do you guys mean by ashy sorry if that question seems dumb. My crabs are gray in colour with orange spots at least Jack and Houdini is so I don't know exactly what ashy would look like on them (gray=ashy to me haha) but they have been that colour since I got them. Just watch them - you may not be able to spot their first molt because you're unfamiliar with what their coloring will be, but you should be able to start seeing it. It's easier to see on big crabs, because small ones molt much more often (if given a nutritious diet) so a lot of the time they will molt with no warning signs at all. Mine never have any of the symptoms of an impending molt before they dig down (except for the medium-sized adoptee who looked honestly like somebody had taken sandpaper to his exo - that was kind of the color, like if you use a nail file over nail polish, how you get lighter spots (flakes of nail polish) over top of the actual color).